Rumor has it LG Display builds the OLED panel in Sony’s hot new TV, but Sony says its impressive Acoustic Surface is homegrown and patent pending. Update:There's been a fair amount of discussion about the two key technologies in Sony's new Bravia XBR-A1E series of OLED smart TVs, so we reached out to Sony for clarification. A company spokesperson confirmed that Sony does not manufacture the A1E-series' OLED panel, but declined to say where the panels are being sourced from. 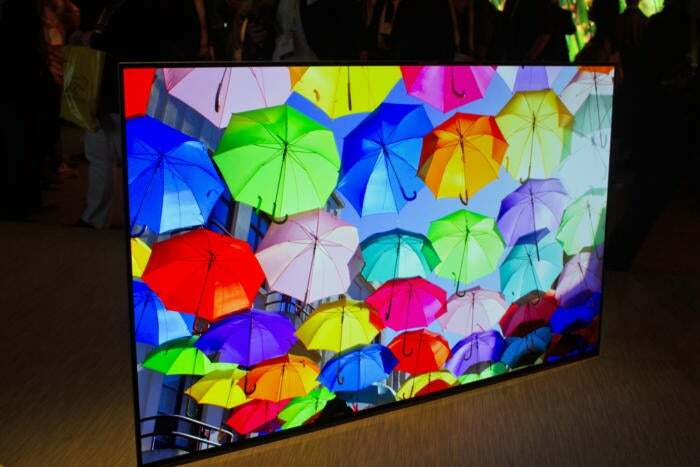 Declining to identify suppliers is not an uncommon practice in any industry, but it doesn't take much imagination to speculate that Sony is sourcing its OLED panels from LG Display, which also provides the OLED panels for Panasonic's THX-certified Viera TX-65CZ950 smart TV. LG Display started out as a joint venture between LG Electronics and Philips Electronics and is now an independent, publicly traded company. The Sony spokesperson went on to say that the OLED panel is just one factor contributing to the A1E-series' display performance, that Sony's X1 Extreme processor and the software running on it is a key differentiator. As for Sony's Acoustic Surface technology, which is the focus of this article, the spokesperson said "While LG is working on a version called 'Crystal Sound,' the Acoustic Surface technology was developed solely by Sony. Using an actuator to produce sound is generic principle technology, but to my knowledge the A1E series is the first large screen TV using this type of sound technology. A patent is now pending." Sony had just one OLED TV in its lineup prior to CES, a 30-inch model that it sold to Hollywood professionals for $18,000 a pop. Now it’s found a reason to build a consumer OLED to compete with its arch-rival and longtime OLED proponent LG: a new audio technology that transforms an entire OLED panel into a giant speaker. The company invited me to what it described as a “black box demo” to see its pride and joy: The Bravia A1E OLED. I was directed to a warren of enclosed, all-black cubicles with no signage or branding that was that was hundreds of feet away from Sony’s huge CES exhibit. It was like entering the Area 51 of CES. Ushered inside one of these rooms with four other tech journalists, I was introduced to the the lead engineers who created the XBR-A1E. Their demo started with audio performance, and that’s the focus of this article. The XBR-A1E delivers a stunning picture—the best I’ve seen from any type of TV—but its audio performance is what really blew me away. Sony’s Bravia XBR-1AE photographed on the show floor. Note how thin the OLED panel is, with all of the TV’s electronics mounted inside its easel-like stand. 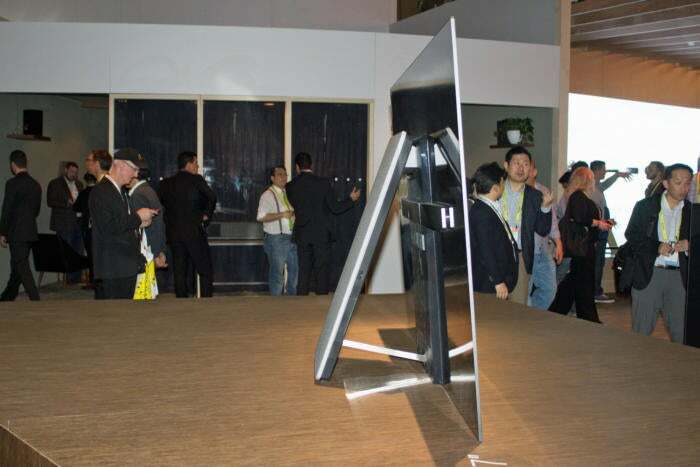 For years, the TV industry has been battling it out to see who can build the thinnest possible TV. As the panels have become skinnier and the bezels have retreated from the edges of the glass, there’s literally nowhere left to mount speakers. Most companies put them at the bottom of the display, making the bezel taller in that one place to accommodate them; but when they do that, the image displayed on the screen can reflect on the bezel and create a visual distraction. Even then, the speakers so small that they sound reedy and weak because there’s no meaningful enclosure for them to resonate in. Bass response? No way. Each mount has two actuators, with one mount on the left-hand side of the display and the other on the right-hand panel. Sony’s solution? Turn the entire OLED panel into a high-frequency speaker by mounting four “actuators” on the back of the panel itself, two on the left side and two on the right. 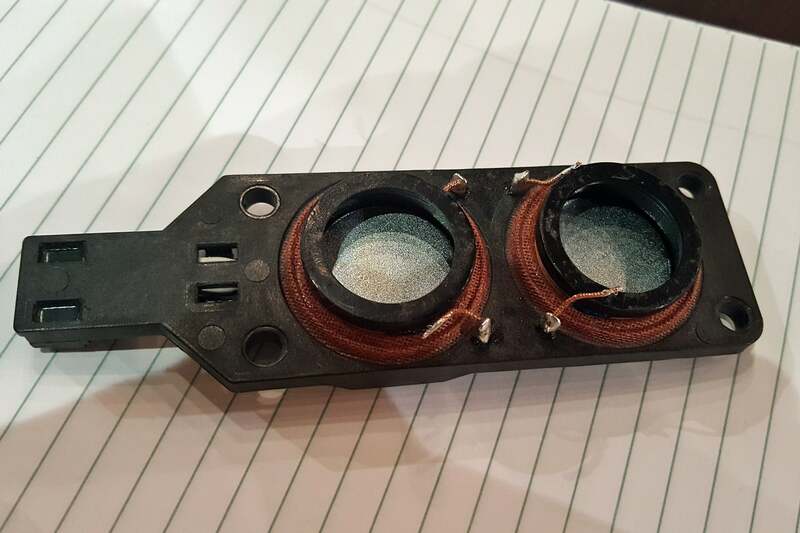 The devices are similar to the transducers used in the manufacture of some flat loudspeakers. And as is the case with transducers, Sony’s actuators need to be supplemented with a more conventional cone woofer to deliver bass response. 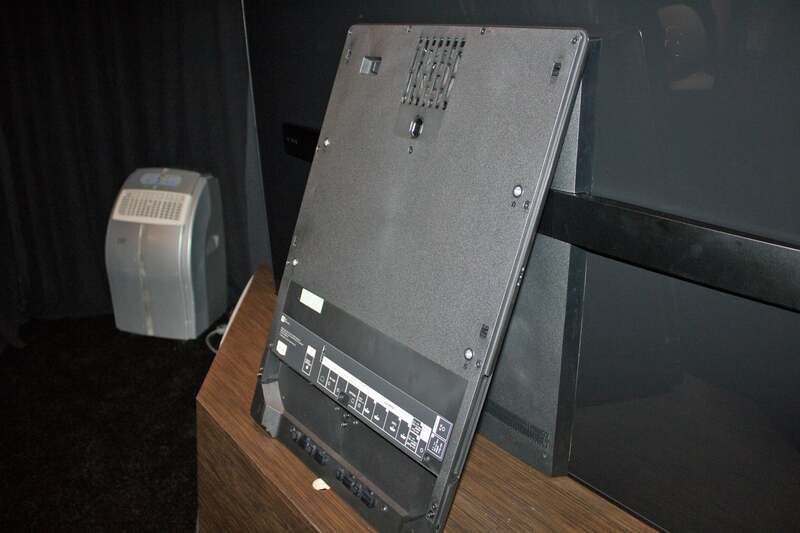 In the case of the Bravia XBR-A1E OLED, a 6cm subwoofer is embedded in the TV’s easel-like stand along with the rest of the TV’s electronics. Touch the panel itself while audio is playing, and you can feel the OLED vibrate. Amazingly, the vibration doesn’t introduce jitter into the picture. What’s more, the audio follows the video and is tied closely to the action on the screen. If an actor on the screen moves from left to right across the screen while speaking, the actor’s voice will pan across the screen with them. The XBR-A1E’s audio performance has to be heard to be believed. The XBR-A1E’s 6cm subwoofer is mounted at the top of it’s easel-like stand. Sony’s audio magic won’t convince any of us who’ve invested in home-theater audio equipment to give up our A/V receivers, stand-alone subwoofers, and multiple discrete loudspeakers no matter how innovative Sony’s actuator tech might be. But for someone who wants to hang a high-end TV on the wall and get good sound without resorting to hanging a boxy sound bar underneath it, it will probably be more than good enough. We hope to get an XBR-A1E-series TV when it goes on sale later this year (Sony hasn’t announced pricing or availability). We’ll be able to deliver a more studied opinion then. Note: This story was originally published on January 7 and was updated January 12 with new information.